Ever since I was quite tiny I’ve had a crush on the Citroën SM. There is something about the shape that I just love. This excellent post at Driven To Write is an extended long term test drive (aka ownership and everyday driving) of the futuristic 1970s Citroën, and simply makes me want one even more than ever. As you know, I enjoy modelmaking of all kinds. I was always fascinated by models and miniatures used in film and TV work when I was a kid. I loved to try and work out how the effects were done, and how big the models might be. Somehow, I found a link to a blog called Matte Shot – a tribute to Golden Era special fx, by a chap in New Zealand. In particular, I fell down a rabbit hole about miniature work in films. It’s a very deep hole, too, but well worth the time as it showcases some extraordinary miniature work from film makers around the world. Prepare to be surprised, too, at just how big some of the miniatures actually were! In the olden days, before computer generated imagery was easy to do and so commonplace that it’s hard to tell what’s real and what’s made up any more, most special effects were accomplished using scale models. If you needed a battleship to blow up, you’d get the props people to make a large scale model, float it in a tank of water and blow it up. If you needed to stage a train crash on a limited budget, you’d call in the model makers and get creative with lighting. If you needed a spaceship, or a complete space fleet and a Death Star or two, who are you going to call? The original Star Wars trilogy was typical of this. In fact, the special effects company that did the work was created specifically for the films—Industrial Light and Magic. They developed many innovative ways to use models for many feature films. I challenge to you spot one in the linked list you haven’t seen at least once! I still love watching films and TV shows were real craft is used for special effects. I love the insane amount of detail that gets crammed into spaceships, often only to be seen for a split second—or blown to bits! I love the fact shortcuts are made by repurposing commercial plastic construction kit components, as well as ordinary household objects. I love trying to figure out how big models are, and how they’re made. Take this detail shot, for example. 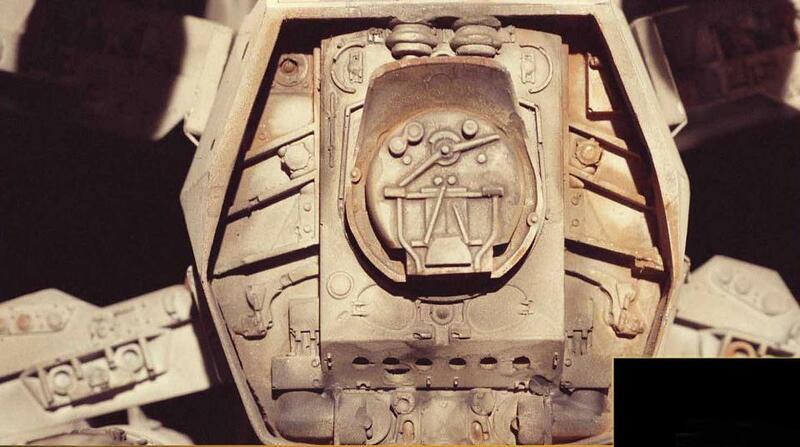 This is from an Imgur site, sharing dozens of detail shots of Star Wars special effects models. As a railway modeller, it’s not hard to spot the use of a steam locomotive firebox backhead, complete with fire hole doors, gauges, lubricators and the regulator handle! In the right context, though, this makes a perfectly acceptable maintenance or access hatch on a spaceship. Spend a few minutes wandering through the images in the site. You won’t be disappointed, and if you grew up with the original Star Wars films you can enjoy a pleasant trip down memory lane. You will be forgiven if the Star Wars theme plays in your head while looking! Incidentally, it’s also worth a look at the imgur site of joinyouinthesun, who posted the Star Wars images. Thanks to my friend Mark Casey for linking to these photos in a post over on X404. PHOTOGRAPH: ISSUE ONE – Craft & Vision. These days, I don’t really subscribe to magazines. There are one or two hobby-related exceptions, but it’s safe to say I have never subscribed to any photography magazines. Until now. Craft & Vision has published a new e-magazine (PDF format) called Photograph. I listened to the publisher, David duChemin, chatting with Martin Bailey on the latter’s podcast, and I was convinced it was worth a look. The price is very reasonable. Photograph is a quarterly downloaded magazine, at $8 an issue. I subscribed for four issues, and the total came to around £15 with the current $/£ exchange rate. The quality is superb, the images are reproduced at the largest possible size, and there are plenty of them. Over 130 pages, pretty much packed with information and inspiration, and best of all there are no adverts (save the final page plugging other Craft & Vision products. The policy seems to be to avoid excessive gear reviews, and to concentrate on the art and not just technique of photography. As long as there aren’t too many tutorials on using Lightroom I will be happy. Being an Aperture user by choice, I feel a bit hard done by when almost every post-processing tutorial assumes you’re an Adobe junkie. Go take a look at the Photograph site, and make up your own mind. I think this is the only photography magazine I will actually maintain a subscription to. Now that’s a step in the right direction. I wish I had the cash to be able to make a pledge and support this. The backstory here is Macromedia FreeHand was absorbed into Adobe some years ago. I think Adobe were after Dreamweaver and Flash technologies, frankly. The upshot was the main competitor to Adobe Illustrator was wiped from the face of the planet. There are still some of us out here working with FreeHand, but it’s a case of maintaining legacy systems to support an ailing software, and it’s not sustainable in the long term. I am always looking for Illustrator/FreeHand alternatives, and I’ve tried a couple. I am currently road-testing something called Sketch, which shows much promise. The problem is most of these smaller developers can’t hope to match all the features of FreeHand. I wish Quasado every success, and I shall be watching progress with interest. Enter James William Paige. Paige, from Rochester, NY, patented a machine in 1872 that could set agate (5½ pt) type.4 In 1877 he went into partnership with J. M. Farnham and the Farnham Typesetting Co in Hartford, CT with the intention of combining his typesetter with their distributor.5 This turned out to impractical and soon Paige began work on a completely new design – the Paige Compositor. By 1878 he had a (barely) working prototype. In my younger days, I worked in a design studio attached to an offset litho printing works. I have nurtured an interest in printing technology ever since, even to the extent of harbouring a desire to get into proper letterpress print. The story of James William Paige tells of dogged determination in the face of insuperable odds. In some ways, I wish Paige had succeeded in his desire to perfect the automatic compositing machine, but it must have been painfully obvious he was destined to fail spectacularly. A man in Hampshire has painted a picture of a Ferrari 250 GTO on the garage door of his home to fool passers-by he owns the classic car. Hats off to Mr Chris Smart of Bishopstoke, Hampshire.